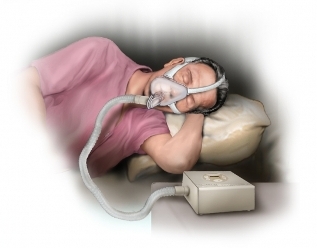 Continuous positive airway pressure (CPAP) for obstructive sleep apnea (OSA). EBSCO DynaMed Plus website. Available at: http://www.dynamed.com/topics/dmp~AN~T186284/Continuous-positive-airway-pressure-CPAP-for-obstructive-sleep-apnea-OSA . Updated June 25, 2018. Accessed August 21, 2018. Obstructive sleep apnea (OSA) in adults. EBSCO DynaMed Plus website. Available at: http://www.dynamed.com/topics/dmp~AN~T115600/Obstructive-sleep-apnea-OSA-in-adults . Updated July 2, 2018. Accessed August 21, 2018.